The way I see it, there are two ways to make a Reeseâ€™s special edition candy, and they hinge on the two main elements of a peanut butter cup: the peanut butter, and the cup. You can take that distinctively dry, salty, crumbly peanut butter and use it in a non-cup format, with results like the Reeseâ€™s Crispy Crunchy Bar, and even non-candy items like Reeseâ€™s Puffs Cereal and Reeseâ€™s Cookies. Or you can take the cup format and mess with it: change the size (Reeseâ€™s Big Cup), the shape (Reeseâ€™s Peanut Butter Eggs), the chocolate coating (Reese’s White Chocolate Peanut Butter Cups), and/or the filling (Reeseâ€™s Elvis Cups). For such a winning-sounding candy concept, Hershey has opted for a suspiciously low-profile release â€“ thereâ€™s nothing about this candy on the Reeseâ€™s website, none of our affiliated candy suppliers carry it and, oh yes, itâ€™s Canada-only. Being fortunate enough to live in said northern climes, I had only to mosey on over to my local Dollarama to obtain a couple of samples for review purposes. 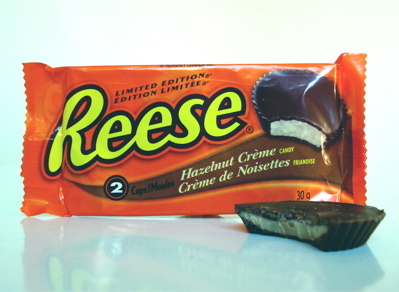 The first thing I notice about the Reese Hazelnut CrÃ¨me cups is that theyâ€™re small â€“ only 15 grams per cup. Upon opening the package, Iâ€™m greeted with a sweet milk-and-hazelnut smell that reminds me of Nutella. The familiar paper liner is conspicuously absent – while regular Reeseâ€™s need the added protection of the paper cup to keep their soft, salty, greasy goodness from soaking into the cardboard liner and being lost forever, these are firm enough to hold up on their own. Actually, theyâ€™re very firm, way firmer than youâ€™d expect from something with â€œcrÃ¨meâ€ in its name. Thereâ€™s a slight graininess to the texture, but itâ€™s difficult to tell whether it comes from the filling or the chocolate, since, texture-wise, thereâ€™s not a lot of difference between them. They have a mild but definite Nutella taste to them. Yup, thereâ€™s definitely hazelnuts in there, even if they are way down there on the ingredient list, behind two kinds of hydrogenated oils but well ahead of cocoa. Thatâ€™s right, Hershey has elected to go mockolate for this release. Why, Hershey, why? My final verdict: a resounding â€œmeh.â€ Theyâ€™re not terrible, but there are better (real) chocolate and hazelnut candies on store shelves, especially if you have access to a German or Italian grocery store. If you live in Canada, go ahead and give these a try, but if you don’t, theyâ€™re probably not worth going through customs for. This site is great. Think I’ll send the kids I teach, 8th graders, to find some great material for sugar addicts, crazy candies, etc., for a paper this year! I have seen many variations of standards….my grandpa was a candy salesman….from 1932 to 1990. I was the coolest kid on the block and got to try all the new candy and had all the samples before any of the stores. Doing this to Reese’s may actually be a crime with the punishment of hanging. How DARE they mess with the peanut butter? Package it all you want in different wrappers, shapes, even use white chocolate…whatever….but DON’T TOUCH THE PEANUT BUTTER. Damn, I miss the Banana Creme Reeses. I wish they would make those permenantly available.